Elizabeth Ann Seton is the first American-born saint. To begin her story, picture the world in 1774. The scene is bustling New York City, a principal trade center of the colonies, and it is 2 years before the American Revolution. The time period is one of plots and secret meetings and concern for the future of the New World. Her father is a doctor who becomes New York’s first health officer. They are a devout Episcopalian family. Her mother dies when she was only three years old. In 1794 Elizabeth married William Magee Seton, a rich business man. They had five children, three daughters and two sons. Elizabeth became good friends with her sister-in-law Rebecca Seton and together they went on missions of mercy to help the poor of New York. They did so much work for the poor, they were called the 'Protestant Sisters of Charity.' Before her last child was born, Elizabeth’s life changed dramatically. Her father-in-law died, leaving Will with a failing business and Elizabeth with Will’s seven brothers and sisters to add to her already full household. She took over the bookkeeping for her husband’s business, working long hours at night. They cut expenses every way possible, but eventually had to declare bankruptcy. William became very ill with tuberculosis. Some business friends encouraged William and Elizabeth to sail to Italy in an attempt to save William’s life. Her husband died on that visit. The friends they stayed with, the Fillichis, were Catholics, and while Elizabeth was in Italy, she learned about the Catholic faith. Seeing how the Fillichis’ Catholic faith sustained them, she longed for their certainty, and the sight of the Blessed Sacrament passing in procession by her window created in her a great desire to believe as they did. When she returned to New York, she continued to learn about the Catholic faith, and was baptized into the Catholic Church. She returned to the United States, a homeless single parent with little worldly goods and no income. Most of her family and friends did not approve of her conversion. After her baptism, they stopped visiting her, and would not help her support her family. It was a bleak time, but Elizabeth’s faith was strong. With the encouragement of a priest and Archbishop Carroll, she moved with the children to Baltimore. Elizabeth needed a way to support her family, so she opened a school for girls in Baltimore. With her spiritual life steadily deepening, Elizabeth felt called to religious life. She faced new obstacles and misunderstandings. An arrangement was agreed upon where she could care for her children and receive the habit, a modified version of her widow’s garb. She wanted to teach children and help the poor. Other women helped her, including her sister-in-law Rebecca, who also converted to Catholicism. The community of women grew. After a few years, they were organized into a religious community called the Sisters of Charity of St. Joseph. Elizabeth Ann was chosen to be their first superior. 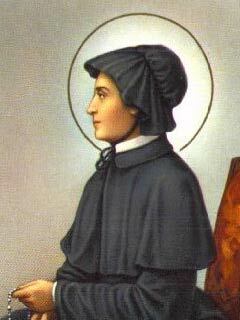 She was called “Mother Seton.” The Sisters of Charity are still active today, teaching children and helping the poor. Elizabeth also did a great deal of writing. She translated many French spiritual works, composed hymns and other music, and kept detailed diaries and journals of her spiritual progress and struggles. The nuns and students were often sick. Tuberculosis struck one after another of Elizabeth’s family. She was holding her daughter, Anna when she died, then she buried her much loved sister-in-law, Rebecca Seton, and just a few years later, her fourteen year old daughter, also named Rebecca, died. She was 46 when the disease that had taken so many of her loved ones attacked her, too. As she suffered with the tuberculosis, her sick bed was placed so she could see at all times the tabernacle with the Blessed Sacrament. Only her daughter, Catherine, and her Sisters were with her when she died. Her last words to them were “Be children of the Church. Be children of the Church.” By the time she died on January 4, 1821, the Sisters of Charity had 20 houses in North America. The first miracle credited to her intercession was the cure of a nun who suffered from cancer. This occurred in New Orleans, Louisiana in 1935. She was declared Blessed in 1963 by Pope John XXIII, the first step toward her canonization. She was canonized as a saint in 1975 by Pope John Paul II.